We are pleased to be supporting a local Floridian in pursuing their educational goals through our disaster preparation scholarship. 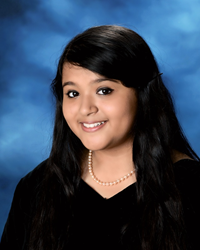 Samira Ahmed of Haines City, FL will be awarded $1,500 for submitting the winning video entry, providing a concise, professional and succinct video presentation of the proper way to prepare for a disaster. In a tie for second place, Brighton Pokupec and Janel Brinkman will both be awarded $250 each. Samira’s winning entry, as well as the other two winners, are available to view on ServiceMaster By Glenn’s YouTube page at http://bit.ly/28SvBji. Learning how to properly prepare for disasters and catastrophes are valuable tools in any student’s skillset. ServiceMaster By Glenn’s offered the Disaster Preparation scholarship to high school or college students that demonstrated knowledge in how to properly prepare for hurricanes or flooding disasters via a 2-5 minute video on disaster preparation. ServiceMaster By Glenn’s required that the video must use visual aids and proper citation of research on how a business can properly prepare for a disaster and judged the video on the following: content, originality, creativity, and use of the ServiceMaster Restore branding. Samira will be awarded the scholarship money after 6 weeks of enrollment into University of Florida, where she has already been accepted. ServiceMaster By Glenn’s will be offering this scholarship again in the 2016-2017 school year. Interested applicants can submit their video entry any time prior to May 1, 2017 at https://waterdamagespecialists.com/scholarship. ServiceMaster By Glenn’s provides water damage restoration, flood damage, fire damage repair, smoke damage, mold remediation and disaster planning and recovery services to the Treasure Coast. Located in Vero Beach, they service the surrounding cities of Sebastian, Ft. Pierce, Port St. Lucie, Jensen Beach, Stuart, Palm City and Hobe Sound. Learn more about ServiceMaster By Glenn’s restoration services at http://www.waterdamagespecialists.com or call 772-567-4435, visit on Facebook at facebook.com/servicemasterbyglenns and download their app on the iTunes and Google Play store.